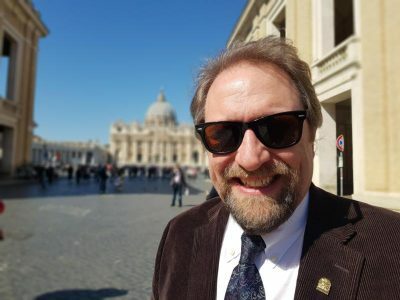 “People on the left and right both find things to connect to Chesterton,” Ahlquist told Catholic News Service March 22. Ahlquist’s latest book, titled “Knight of the Holy Ghost,” is “designed to introduce people to Chesterton,” who lived from 1874 to 1936. “There are some excellent biographies out there that are very good. But sometimes, Chesterton can get lost in the details and I wanted to bring out the highlights, some of the most important features of his life so that he stands out,” he said. Ahlquist, who serves as president of the Society of Gilbert Keith Chesterton, a Catholic lay apostolate inspired by the early 20th century writer, also makes the case for Chesterton’s sainthood cause. Now it is up to the bishop to request Vatican permission to open the cause. “It’s one of those things that the more it gets repeated, the more it is believed,” Ahlquist said. Chesterton, he argued, spoke out against eugenics, the controlled breeding of the human race to promote or eliminate certain traits, which rose to prominence in the United States and Europe, especially Nazi Germany. The policy is believed to have been the precursor to the Nazi’s “Final Solution” resulting in the genocide of an estimated 6 million European Jews. Others, he added, object to his canonization because he enjoyed drinking, or they accuse him of being a “glutton because he was fat.” The latter charge, Ahlquist quipped, was not made against St. John XXIII or St. Thomas Aquinas before their canonizations. The Catholic writer and philosopher may also find a kindred spirit in the current occupant of St. Peter’s chair. As archbishop of Buenos Aires, Argentina, Pope Francis opened a conference sponsored by the G. K. Chesterton Institute for Faith and Culture in 2006 and also approved a prayer for Chesterton’s intercession. However, several coincidences point to a greater connection between the pontiff and the philosopher, the author said. Both share an affinity for St. Francis of Assisi: The pope adopted the saint’s name following his 2013 election while Chesterton took the name Francis when he was baptized. Like their namesake, both men shared a way of engaging with both Catholics and non-Catholics alike. Ahlquist also recalled a notable coincidence that points to a papal connection with Chesterton. In his book, “St. Francis of Assisi,” Chesterton highlighted the importance of St. Benedict’s preservation of Christian culture and learning in the monastic system. On the other hand, he noted, St. Francis took the monastic order to the streets when he founded the Franciscan order.